Niagara SkyWheel is a 175-foot (53.3 m) tall Ferris wheel in the middle of Clifton Hill’s world famous Street of Fun by the Falls in Niagara Falls, Ontario, Canada. The SkyWheel is a Ronald Bussink Professional Rides designed R60 Giant Wheel, manufactured by Chance Rides and supplied by Chance Morgan. It opened on June 17, 2006 at a cost of $10 million (Source: Wikipedia). Niagara Skywheel gondolas hold up to 8 people and are climate controlled (left). The Skywheel is 175 feet (53m) tall and rises above the Dinosaur Park Miniature Golf in Niagara Falls, Ontario, Canada. Websites and brochures claim each of the Skywheel’s gondolas holds up to eight people. After being in one, I would say it would hold up to six people comfortably. Admission is quite reasonable for the twelve to fifteen minute ride at $10.99CDN for Adults and $6.99CDN for children aged twelve and under. 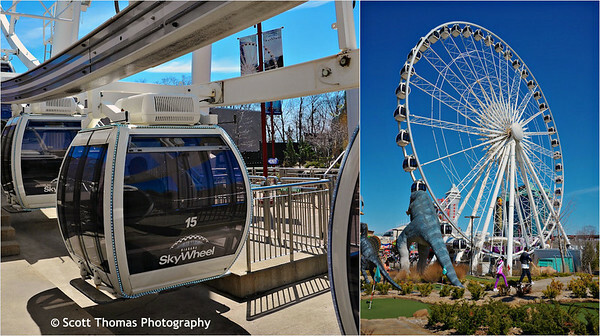 The Skywheel is open year around with the gondolas climate controlled for comfort. Looking towards the center of the Niagara Skywheel while riding it in Niagara Falls, Ontario, Canada. Nikon D700/24-120VR, 1/160s, f/16, ISO 200, EV -0.3, 24mm focal length. The ride is smooth and rotates at a leisurely pace giving riders ample time to take in the sights both natural and Man-made in the Niagara Falls area. 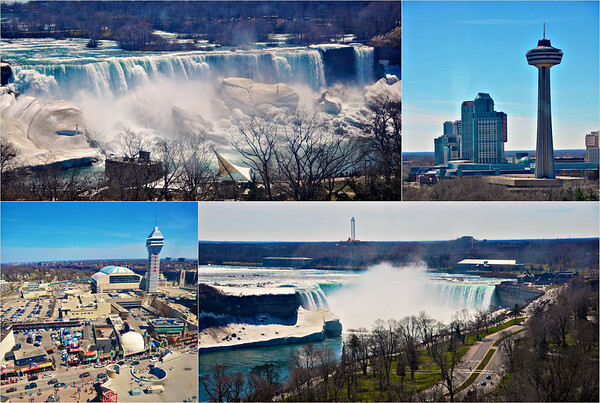 From top left: American Falls, Skylon Tower and Fallsview Casino Resort, Horseshoe Falls and Clifton Hill attractions and Casino Niagara as seen from the Niagara Skywheel in Niagara Falls, Ontario, Canada. Photographing from a Skywheel gondola is easy. 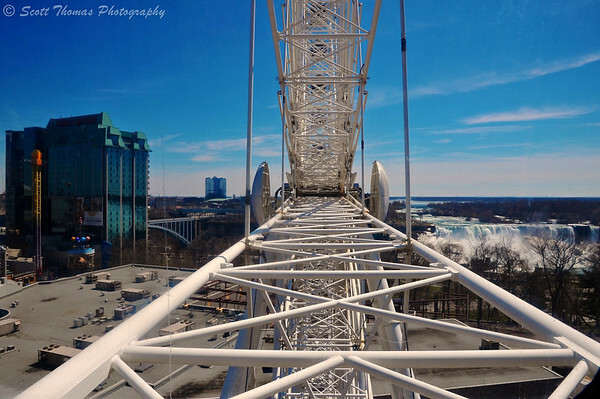 The slow, smooth motion and stops as people get on and off the Skywheel give lots of opportunities to photograph both American and Horseshoe Falls and the surrounding attractions. Be aware the glass is tinted to help keep them cool on sunny days which will take a little extra time in processing the photos. This entry was posted in Travel, Weekly View and tagged 24-120mm, blue, canada, casino, clifton hill, clouds, dinosaur park, fallsview, gondola, miniature golf, niagara, niagara falls, nikon D700, nini golf, ontario, sky, skylon tower, skywheel, tourists, vr, water, waterfall. Bookmark the permalink. I am astonished at how much the Niagara Falls area has changed since I was there last. (I am further astonished at how long it’s been since I was there . . . oh dear.) Those are terrific images. Thanks for another great post Scott. I have been on the Skywheel out in Seattle and in Atlanta. While I have been up in Niagara I have not been on the wheel. Have to put that on my list. The view looks amazing. We are getting one in Orlando but feel location is not very scenic. I saw one of your pictures on flickr and am glad to see and know more of this wonderful site. Thank you Scott. This is great mosaic you created there.